The following is a summary of Michael Trachtman’s 2018 HR & Employment Law Conference presentation. Mike will also be returning as the keynote speaker at MEA’s 2019 HR & Employment Law Conference on May 2. Every business needs to know, and truly appreciate, the fact that the law is more than a compliance manual – rather, it is a compendium of tools that can be utilized to maximize business advantages, minimize business disadvantages, implement business plans, and achieve business results. The trick (that is, the distinction between using, or being used by, the law) is multifaceted: you will need to know what the law says, what it means in practice, how it is changing, and how it will likely be interpreted and applied in different circumstances. That is a challenging task, especially when it comes to employment law, where uncertainty has become a singular constant. Nevertheless, uncertainty cannot be an excuse for inaction – especially in view of the monumental risks inherent in the world of potential employment-related liabilities. With that in mind, I offer the following general cautions and suggestions – with the proviso that there is no one-size-fits-all solution, and any approach to these difficult issues must be fine-tuned in accordance with the individual details and nuances of each business. We are in the midst of an obvious culture shift in respect to sexual harassment. At least this much is clear: the standard policies and procedures that worked a few years ago will not work now. Most workplaces address sexual harassment by prohibiting inappropriate conduct that is “severe and pervasive” and, in fact, under the law, inappropriate conduct that does not meet the “severe and pervasive” standard will not amount to sexual harassment. However, given society’s newly developing attitude toward sexual harassment, workplace morale and employee retention will depend upon consistently enforced policies and procedures that address inappropriate conduct that falls well short of the traditional “severe and pervasive” line in the sand. Lower the bar: policies, procedures and anti-harassment training must address conduct that may still be lawful under current legal standards, but will be viewed as intolerable under today’s evolving standards. How far to lower the bar will depend upon the nature of the workplace, and other legal issues – get guidance. The new rules, however defined, must be modeled by those in the C-suite, and the rules must be consistently enforced from the C-suite downwards. If recent media coverage means anything, it means this: the days of one set of rules for the top executives, and another set of rules for everyone else, are long gone. At the same time, not every accusation of misconduct will be true – the rights of the accused, and the potential defamation risks that will arise out of unwarranted accusations, must be part of the program. Similarly, while the “severe and pervasive” standard may no longer be realistic, the pendulum can swing too far the other way, creating workplaces with unrealistic rules and standards. The issue of romantic relationships in the workplace can no longer be ignored. Workplace relationships are an incubator of some of the most serious forms of sexual harassment. Each workplace is different, each culture is different, and there are a variety of ways to address these issues. Get guidance. There is substantial uncertainty, and risk, in respect to drug testing and medical marijuana, which remains unlawful under federal criminal law, but lawful under the law of many states. The question, therefore, is this: if an individual tests positive for medical marijuana, and if the employee documents that the employee is using medical marijuana to treat a physical or emotional condition pursuant to a physician’s orders, can an employer refuse to hire, or terminate, or otherwise discipline that individual for violating federal law? There is no clear answer, but there is a real risk that an employer will be found to have violated the ADA if it refuses to accommodate medical marijuana use in these circumstances. Get counsel. Additional challenges arise in the effort to distinguish through a drug testing protocol the use of medical marijuana as opposed to unlawful marijuana. Technology is changing and (wait for it …) the smoke is starting to clear on this issue, but it remains fraught with difficulties. Understand what you can test for pre-offer, as opposed to after an individual is offered a position. Understand your obligations of confidentiality. Understand when a drug test result may trigger an obligation under the ADA to offer a reasonable accommodation. Understand the implications of drug testing that reveals the use of opioids, which may be lawful or unlawful, and which may raise serious legal issues, depending on the circumstances. Can You Prohibit Political Arguments In The Workplace? Our society has become characterized by frequent, strident disagreements over an array of political and cultural issues. In a workplace setting, these disagreements can fracture relationships and create the kind of discord that can affect productivity. Can you ban political discussions in the workplace? What about your employees’ First Amendment rights? Two points are particularly important in this context. First, the First Amendment only applies to actions by the government – not actions taken by private companies. There is no First Amendment prohibition against an employer’s effort to regulate workplace speech that may interfere with the employer’s workplace requirements. Second, even though the First Amendment may not apply, there is another limit that must be respected. Section 7 of the National Labor Relations Act prohibits an employer from interfering with its employees’ rights to discuss their terms and conditions of employment. The law was enacted so that employees could join together, in unions or otherwise, to redress their workplace grievances in respect to wages, hours, working conditions, and so on. The difficulty arises in the potential overlaps between Section 7 and the political discussions, even vituperative arguments, that characterize so many of our interchanges. Do debates over immigration, tariffs, affirmative action, and even the pros and cons of various candidates constitute political debates or workplace debates? Or both? Where can you draw the “knock it off and get back to work” lines? Like so much in employment law, these issues remain murky … and dangerous. Retention of key employees is extremely important in this economy – a key employee’s defection (taking with him or her your customer list, marketing plan and “secret sauce”) can be the difference between success and failure. Properly drafted and in the right circumstances, non-competes can be enforceable if they conform to certain criteria, subject to certain limitations. The drafting of an enforceable non-compete definitely requires the assistance of experienced counsel. The problem, however, is this: even if you prepare an enforceable non-compete, will the employee sign it? An agreement allowing post-termination competition, but only prohibiting employment by certain of your competitors. An agreement allowing post-termination competition, but only prohibiting the solicitation of your clients/customers, or certain of your clients/customers. A proper confidentiality and trade secrets agreement. A company-wide system that protects certain information through adherence to state and federal trade secrets laws. “Golden handcuffs” arrangements that incentivize key employees to stay through deferred compensation arrangements and bonus programs that vest over time. Pay Equity: The Next Big Thing? The concept of “equal pay for equal work” — without regard for gender, race, nationality and other protected characteristics – has garnered widespread and growing popular and political support. In practice, however, implementing a fair system that accounts for seniority, merit, output, quality, intangibles and other factors can be a challenge. Many equal pay lawsuits have been based on the 1963 federal Equal Pay Act, but in addition to lacking a predictable way to account for the complexities of compensation decisions, the federal law deals only with pay disparities based on gender. Locally, New Jersey prohibits unequal pay for “substantially similar” work and applies to all protected classes, not just gender. There is a heavy burden on employers to justify pay differences, but the system allows for differences based upon seniority, merit, training, experience and other factors. Delaware has a gender-based law, but without much teeth in it. Pennsylvania has a 1968 law prohibiting gender discrimination based upon pay, but includes no right for an individual to bring a private lawsuit based upon the statute. Recently, the equal pay debate has focused on a central issue: may an employer inquire about, and base compensation decisions on, an employee’s compensation history (and, it is argued, thereby perpetuate the inequities of the past)? The EEOC strongly discourages compensation history inquiries, but the law is, to say the least, unsettled. Philadelphia became the first city in the United States to prohibit requests for wage history, the rationale being that what someone made in a previous job should have no bearing on what they make in the next job – their duties and qualifications should be all that an employer should be concerned with. After a lawsuit, however, a Court invalidated the portion of the Philadelphia statute that prohibited employers from requesting wage history – but the message remains clear: if you ask about wage history, you better be able to prove why you asked, and if there is a wage disparity, you better be able to establish a non-discriminatory reason for it. The law respecting an employer’s rights to utilize criminal background checks is a crazy quilt, to say the least. Federal law allows it, but there are hyper-technical requirements that must be followed, including disclosures to employees and other hoop-jumping if an employer uses a third party service to perform the background check. The EEOC argues that employers should rely upon “individualized assessments” of candidates and use background checks in a very limited way, minimizing the use of outdated information and convictions for non-violent crimes that do not bear upon an individual’s qualifications, and allowing for the fact that people change and prior mistakes do not always predict future behavior. The EEOC’s word on this subject is not law – though it may be influential in various courtrooms, states and cities. In Pennsylvania, an employer may consider felony and misdemeanor convictions (not arrests) during the application process, but only to the extent that the convictions relate to an applicant’s suitability for employment in a particular position. In New Jersey, an employer may not inquire into an applicant’s criminal record during the initial employment application process – although there is no restriction on the right to use the information thereafter. Delaware has no law on the subject. Federal, Pennsylvania and New Jersey laws, to the extent they exist, are rife with exceptions and limitations. In the midst of these issues, various, so-called “ban the box” laws arose and Philadelphia has one of the most severe “ban the box” laws in the country. “Ban the box” refers to banning the box on employment applications that requests criminal history information. Philadelphia’s law prohibits criminal history questions of any kind on applications, and allows for no inquiries, background checks or similar investigations until after an offer is made. Philadelphia also bans consideration of any offense over seven years old, and mandates an individual assessment process based upon the findings of the investigation. The courts have yet to flesh out how the Philadelphia law will be applied in practice. This is, again, an area of employment law that is in extreme flux. Get guidance that makes sense in the context of your workplace. The uncertainties in employment law extend to a variety of other issues as well. New perspectives are surfacing in regards to independent contractors, “gig” workers, what kinds of employee characteristics will be legally protected, potential changes in non-exempt salary thresholds, the nature of restrictions on employee use of social media, and much more. And no one can predict where these and other employment law conundrums will land, particularly in view of the present political uncertainties. This is why the universe, in its astounding and eternal wisdom, invented MEA, and (thank goodness) lawyers. Stay tuned. MEA’s outside general counsel, Michael G. Trachtman, is a Wisler Pearlstine partner and the Director of the Wisler Business and Entrepreneurship Center, a practice group designed to meet the needs of small and mid-sized businesses in a pioneering and unique way. 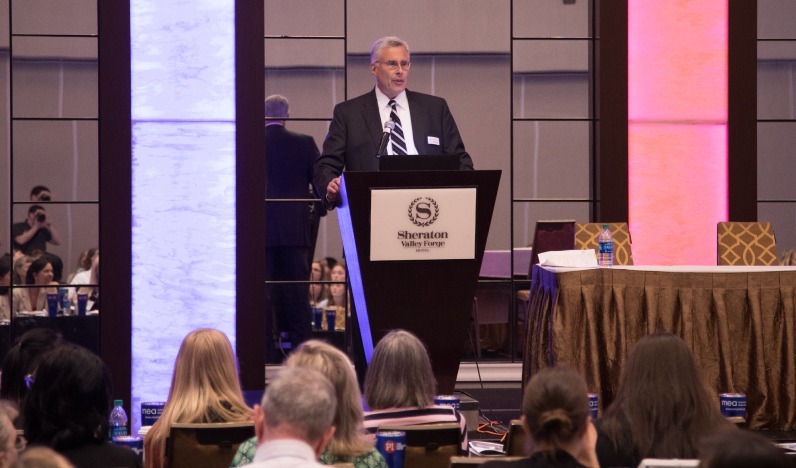 Mike will also be returning as the keynote speaker at MEA’s HR & Employment Law Conference on May 2, 2019, and will discuss where employment law has been, where it’s going, and what to do about it in these turbulent and unpredictable times.